If this building looks vaguely familiar to you, it’s because it’s probably the only building I’ve sketched more than once or twice, let alone five. 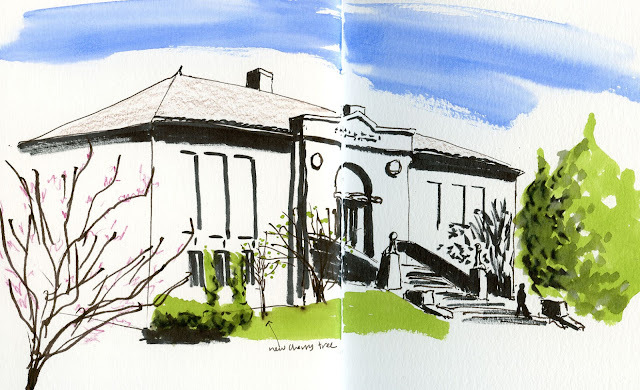 Somehow it became a personal tradition to sketch the Seattle Public Library’s Green Lake branch every year. 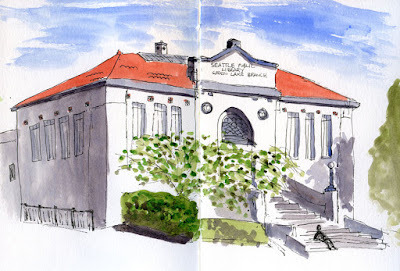 First of all, it’s one of few buildings in my neighborhood with a traditional architectural style that I appreciate (it’s one of several Carnegie libraries we are lucky enough to have in Seattle). 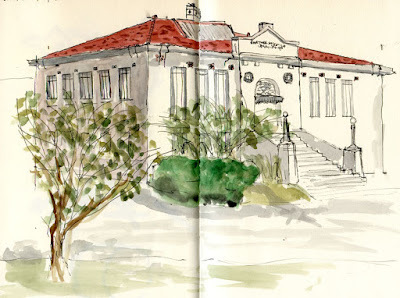 It’s also convenient: I park my car in the library’s lot, return some books, then cross the street to sketch it. There’s even a handy bus shelter and bench where I can set my palette down and ensure that I get the same angle each year. 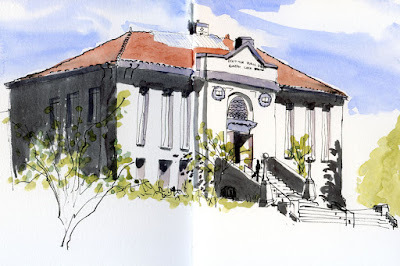 I don’t usually give myself a specific challenge when I sketch it (other than the fact that it’s architecture, which is always a specific challenge for me!). 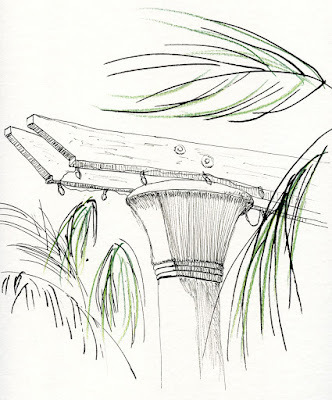 But from my past attempts, I knew that I often get too bogged down in details or the exact hues of the roof tiles and trim. Today I decided to see if I could capture only the essence of the building with as few lines as possible. To make sure I didn’t go back down the usual boggy road, I made the initial line work with my fude fountain pen, which can’t make the extra-thin lines I usually prefer for architecture. 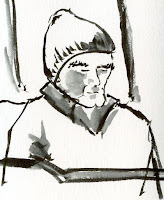 Then I grabbed a brush pen to put in the shadows. 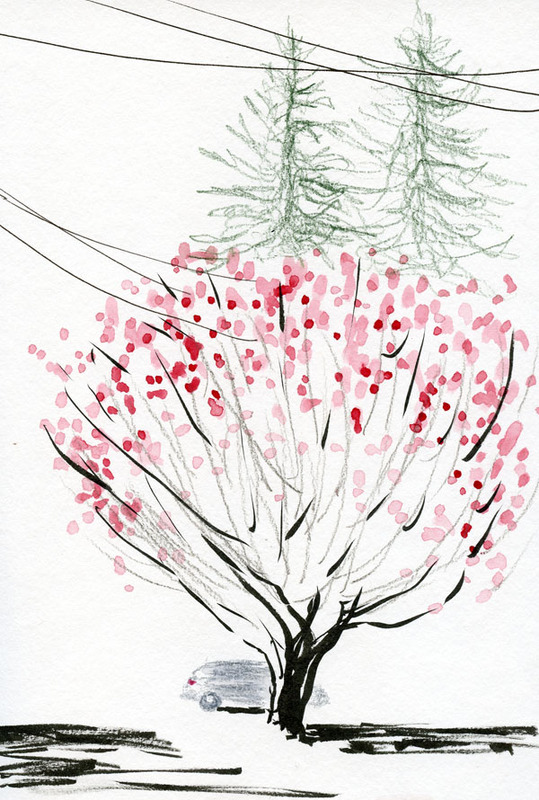 The spots of color came from inks applied with waterbrushes. Done. Below are the previous four years’ sketches of the library. 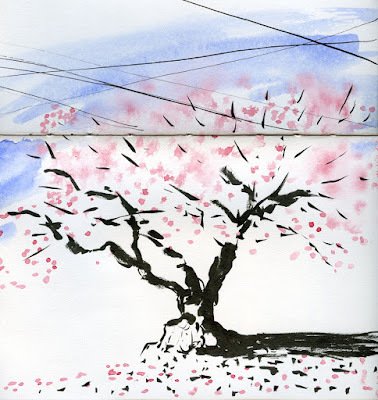 If your goal is to create art you will be looking for an occasion to ‘do a sketch’ making sure that the scene is inspiring and that you have appropriate time to complete it. Of course in the process you will be recording part of your life, but the motivation is to create a beautiful image. She also talked about the ideal occasions when No. 1 and No. 2 merge seamlessly, as when she has more leisure time during her daily life or when she is traveling. Last in line in my sketch (and in reality) was Greg. 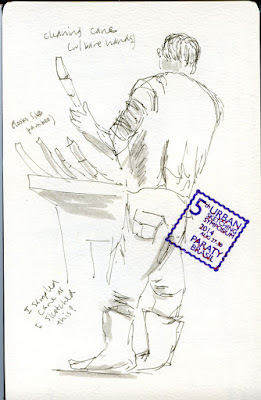 I really appreciate it when I read posts like Liz’s, which make me think about my own sketching process. 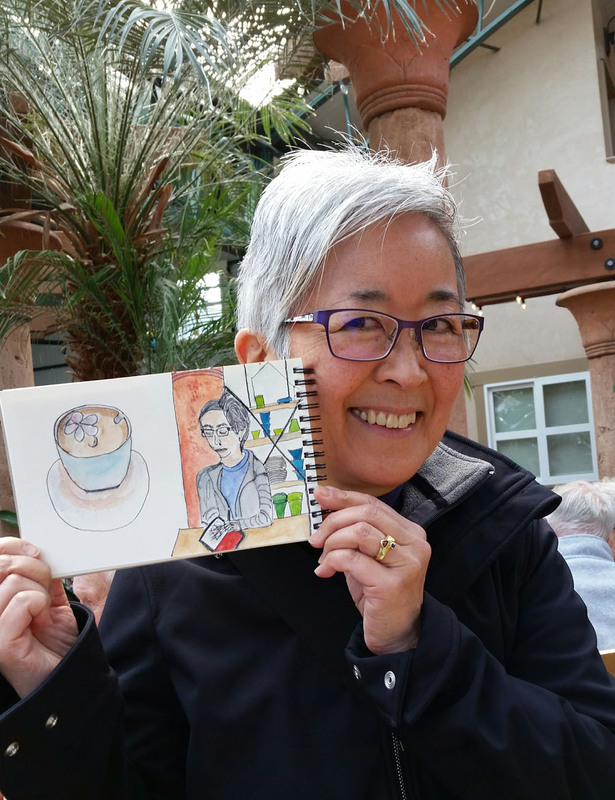 (Many readers shared comments on her post about their own processes, and they were interesting also.) I, too, seem to have at least two or three different ways in which I approach a sketch, although sometimes the choice is made unconsciously. I don’t think I’ve ever begun a sketch with the intention to “create art” or “make a beautiful picture,” although occasionally the result might end up being beautiful. However, I do sometimes set out with the intention (Liz’s term, which I find appropriate also) to make a sketch that I want to tell a “story” of some kind. 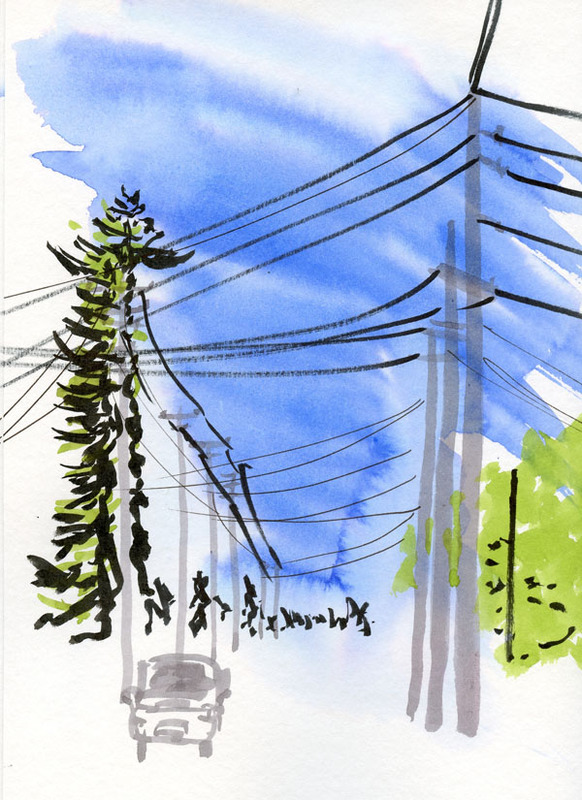 Yesterday at the UW light rail station, I started my first sketch with that intention: I wanted the sketch to tell the visual story about a station finally opening in north Seattle (a big deal in my ‘hood where light rail has been very late in coming). As it turned out, the unexpected cold and rain changed my motivation and intention, and the sketch ended up being more of a “record of my life” type of sketch. I was a little disappointed that I couldn’t spend the time I wanted to on it, but not disappointed that I still got the moment recorded. 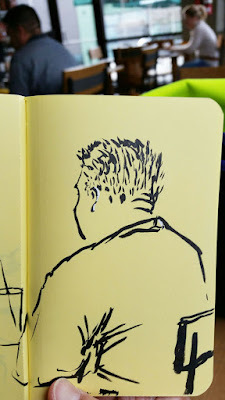 After that, my intention for the whole day changed, and I decided I would approach the rest of my sketches as recorded moments rather than “stories.” I probably spent about the same length of time on the second station sketch as I did on the first, but for that one, I pulled out a brush pen to make faster, bolder lines than a fountain pen. Without the goal to “tell a story,” I found that I enjoyed the process more, and I also ended up liking the finished sketch more. 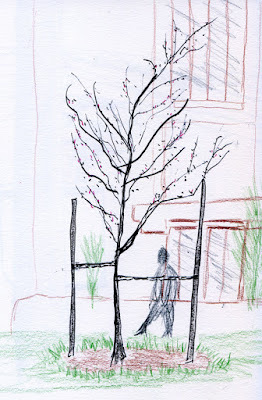 Between those station sketches and throughout the day, I made small, quick sketches that were definitely in the “recorded life” category rather than “stories.” But collectively, they do end up telling a story of the day. Today was a redux of yesterday, this time with Greg. After hearing about my adventures on the light rail, he wanted to check it out himself, so this morning we hopped on the same neighborhood bus and then on the train southbound to Capitol Hill. 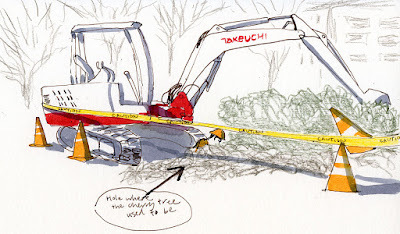 My intention from the get-go was to simply record the day – not make “story” sketches. I filled several pages in my red Field Notes with people on the train, in the pub where we had lunch, and waiting in line at the transit pass office where we had to stop. Again, collectively, they became a record of our day, riding around on public transportation. 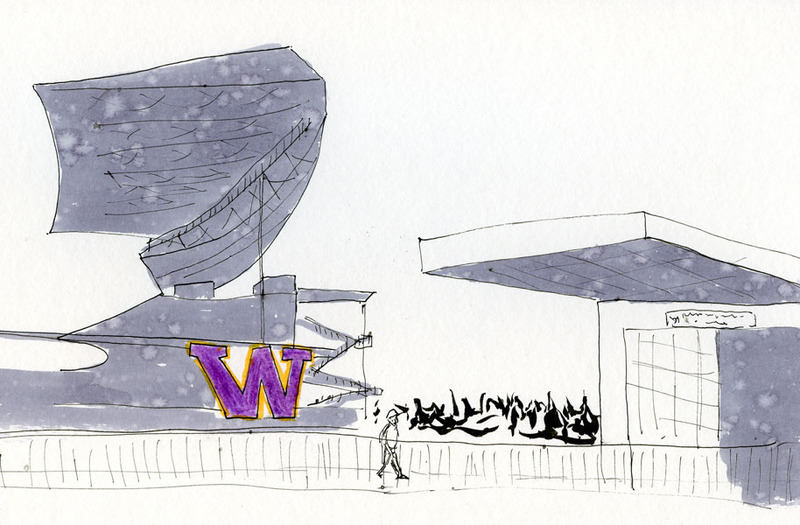 As you might guess, these were enormously fun sketches to do. 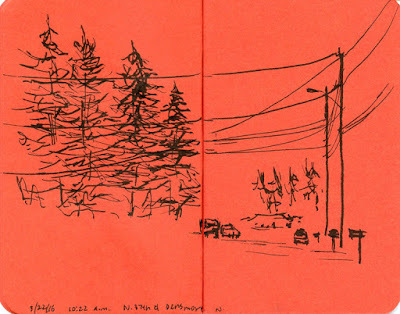 Something about the brightly colored paper in these Field Notes takes the pressure off, and the sketches seem to make themselves. What pressure? I’m usually not even aware of it, but the desire to tell a story with a sketch does set a certain threshold I feel I need to meet. 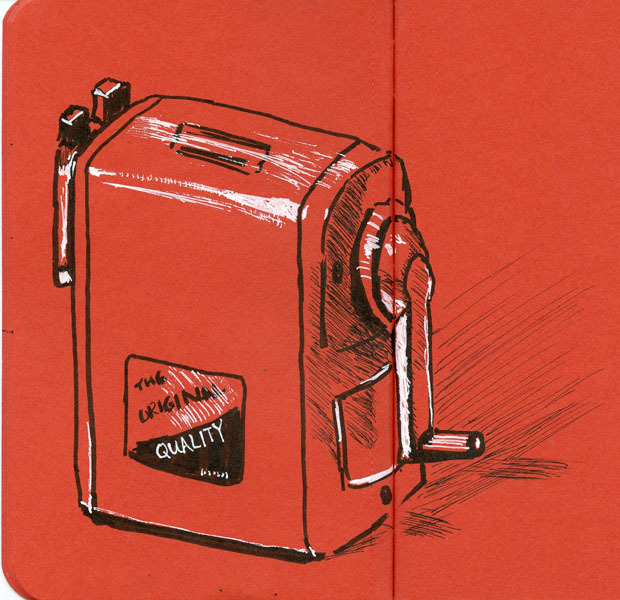 Having a threshold is not a bad thing – I think it pushes me to want to continually improve my drawing skills. 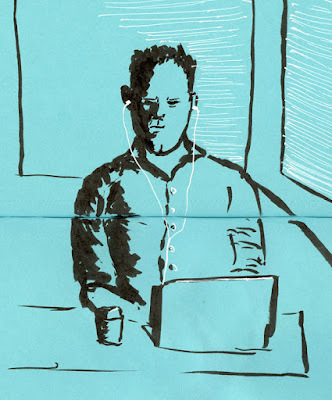 But sometimes the day is only asking to be recorded – not be a story. 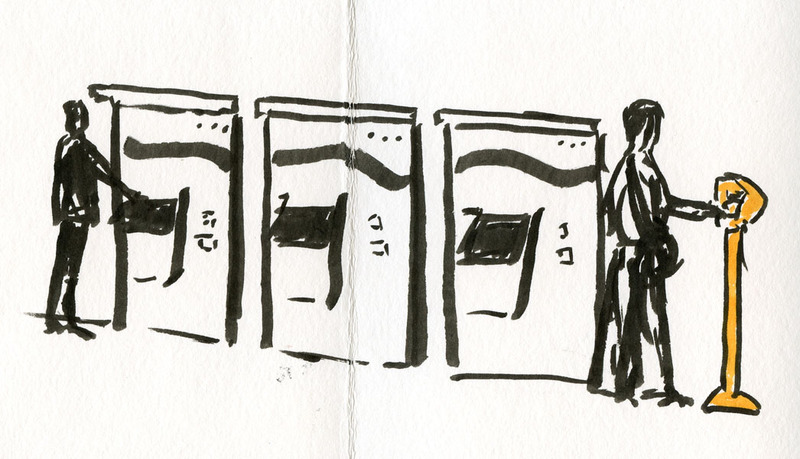 I have at least one other way in which I approach sketching, but I’ll leave that for another post. How about you? Do you have different ways of approaching your sketches? 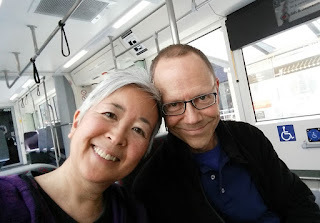 In addition to bus and light rail, we even made it onto the streetcar! 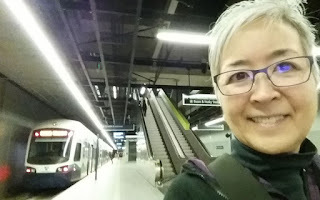 Scouting for a future Seattle USk outing, Kate, Michele, Feather and I met up at Sound Transit Light Rail’s new UW Station this morning. 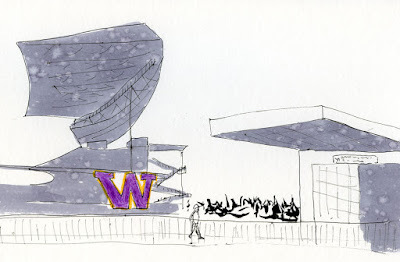 It was a lot colder and wetter than was predicted, so my sketch of the station (and Husky Stadium behind it) got cut short, but I’m posting it here anyway (at right) for posterity. After we rode the rails to Capitol Hill Station, also brand new, and warmed up over lunch, the day had warmed up a bit too, so I sketched the station entrance (above). It’s marked by a huge graphic hand – artwork by local cartoonist and Capitol Hill resident Ellen Forney. 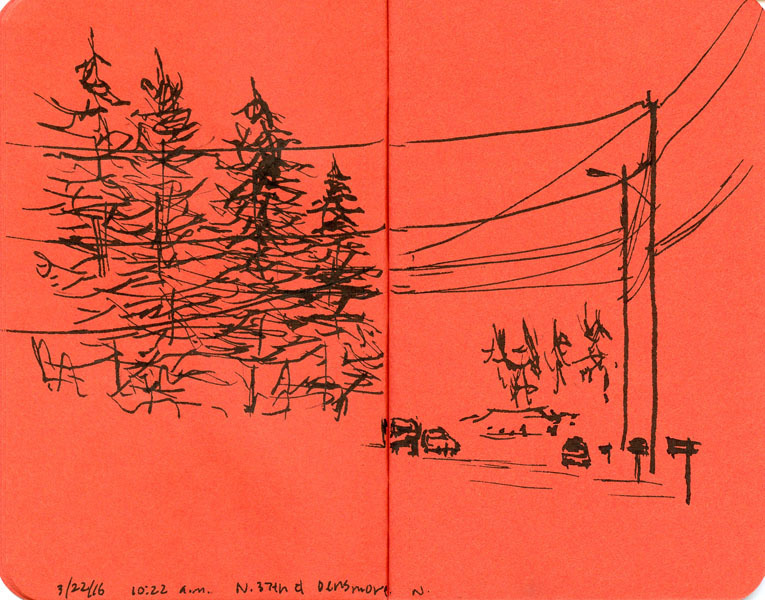 The rest of my sketches for the day were small vignettes made in my red Field Notes and a small accordion-folded book that Michele made and gave to each of us to document today’s “Hop Sketch” (coined by Michele). Stay tuned for more sketches at these stations during a future USk outing – to be scheduled on a warmer day! 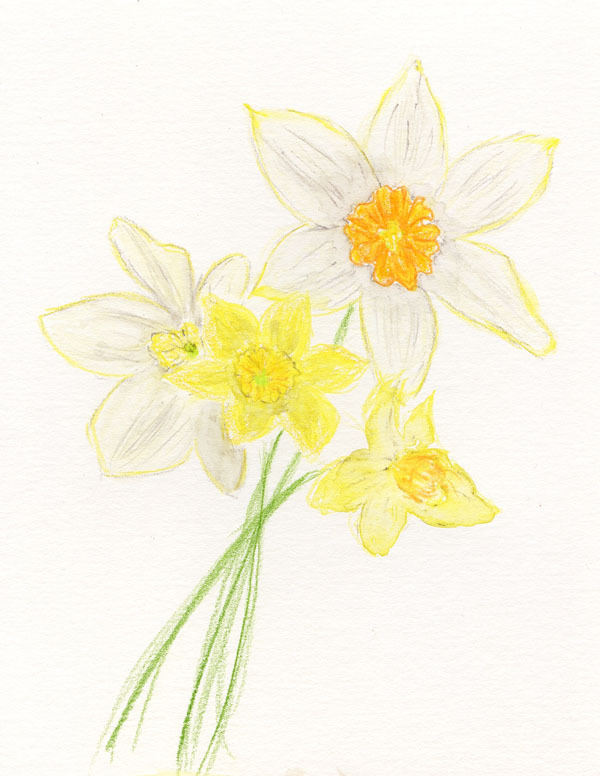 My mother’s favorite flowers were daffodils and all their varieties, including tiny pale yellow jonquils that filled her garden in spring. Unlike she was, I’m not much of a gardener at all, but these little gems faithfully pop up year after year on their own, which helps to make them my favorite, too. Happy Easter! I hope yours is drier than ours is. The Seattle Public Library’s central branch is hosting First Folio: the Book that Gave Us Shakespeare in commemoration of the 400th anniversary of Shakespeare’s death. It was interesting to see such old books on exhibit containing the Bard’s work. 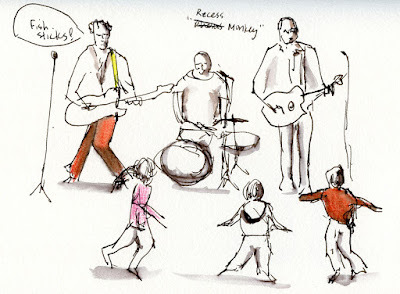 But truth be told, the real reason Natalie and I met there this morning was to sketch the performers – both scheduled and ad hoc – who entertained patrons on Community Day. 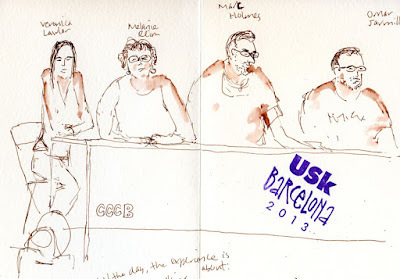 The event turned out to be a fun exercise in sketching people at different levels of activity. 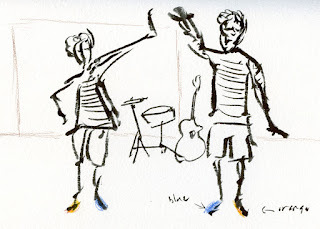 When we first arrived, a couple of actors in striped shirts and mis-matched shoes were putting on an impromptu performance that involved a lot of pratfalls and running back and forth across the floor. 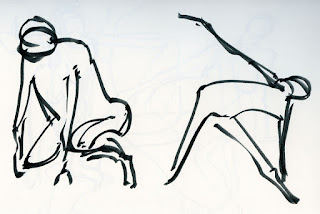 I couldn’t manage more than stick men (below)! 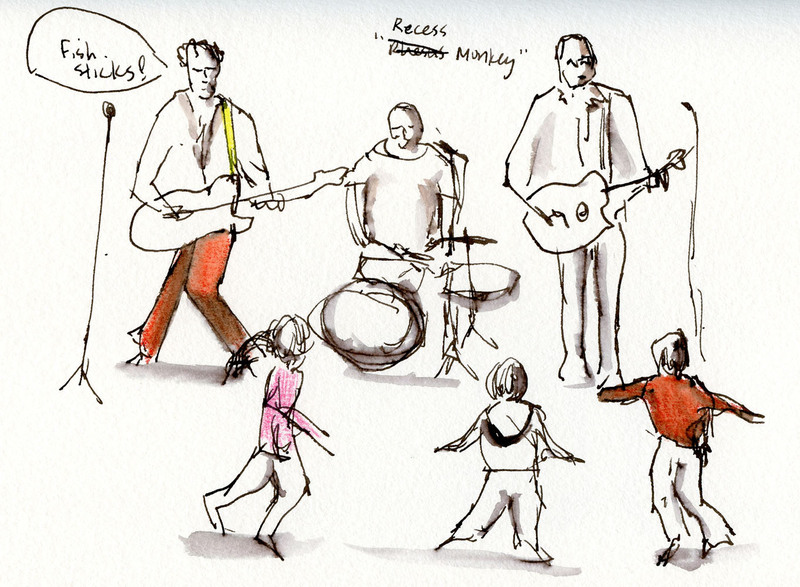 Next an interactive band called Recess Monkey (above) took the stage and invited all the children in the room to join them in dancing. 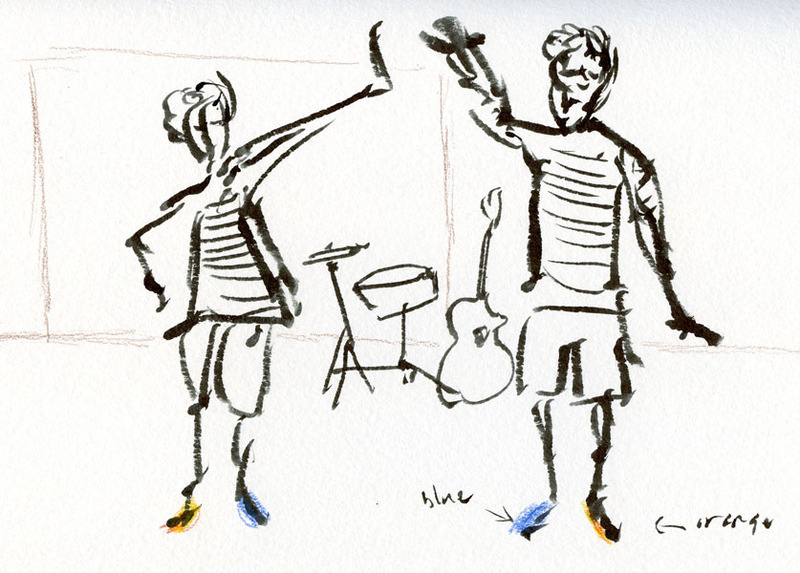 They were not much easier to sketch than the actors, but at least the musicians were tethered to their mic cords. After lunch we went upstairs where more performances were scheduled, and I had a more relaxed time sketching storyteller Eva Abrams (below). My first light rail ride from the new UW Station! Swanson’s Nursery has become an annual holiday tradition for the Friday sketchers because this garden store always brings in a couple of reindeer, a camel and Santa for kids, and the Christmas decorations are beautiful. I think springtime at Swanson’s might become a new tradition – the flowers were plentiful and colorful today. 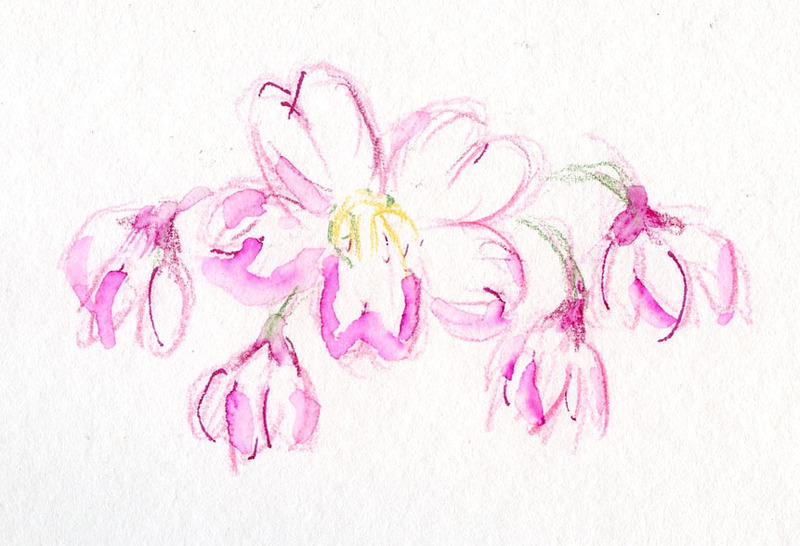 Unfortunately, I was too cold this morning to sketch outdoors where the flowers were. 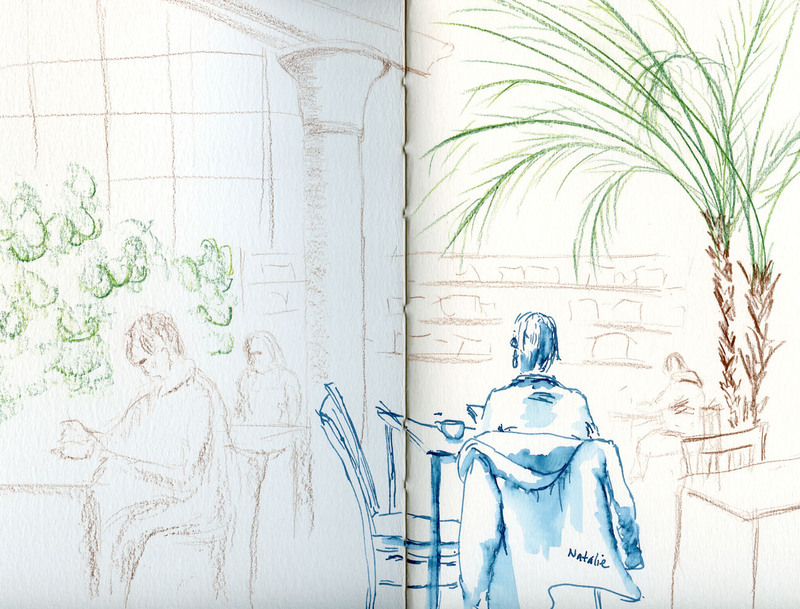 Wimp that I am, I sketched inside the café, which is a jungle of oversized tropical plants. 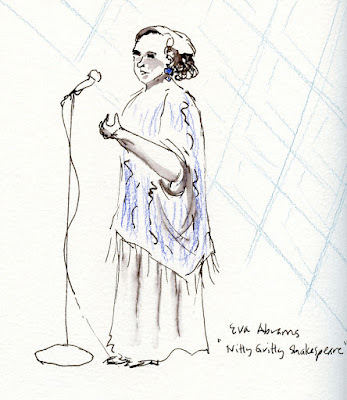 I even made a hatched study of one of the pillars, while Natalie sketched me! 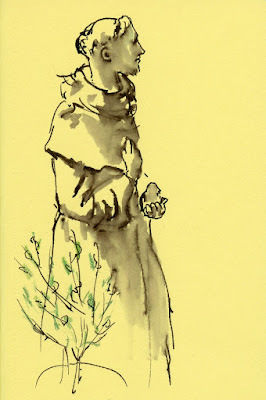 A few minutes before the sharing time, the sun came out, so I ventured out and spotted St. Francis of Assisi. I’m probably the only person in the first world who cares about the potential for using Field Notes’ Sweet Tooth edition for sketching (well, there might be one other person – you know who you are), so I’m not sure why I’m blogging about these little pocket notebooks again. 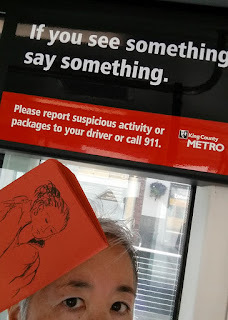 But just like I can’t resist trying papers that I’m pretty sure won’t meet my needs, I also can’t resist documenting my findings for the general public’s edification. After being delighted by the possibilities of using the red paper book in the trio, today I broke out both the blue and the yellow books. 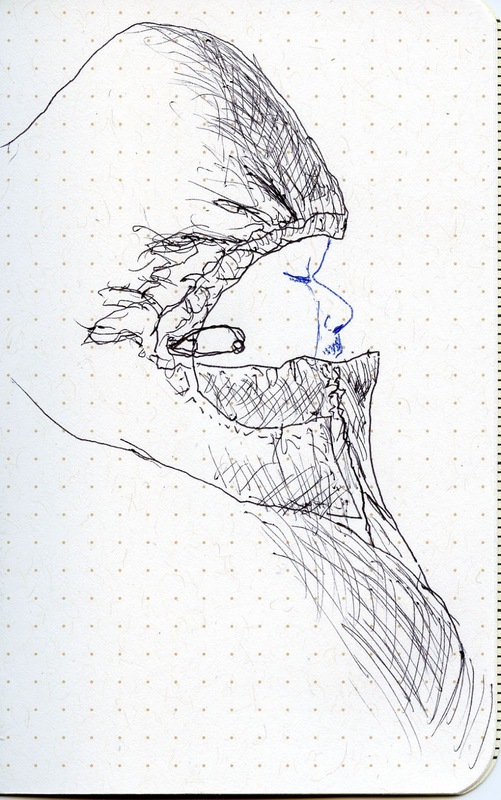 Unlike the red paper, which really made my white gel pen pop, the blue paper (strangely named “Blu Raspberry”) doesn’t show quite the same high contrast. 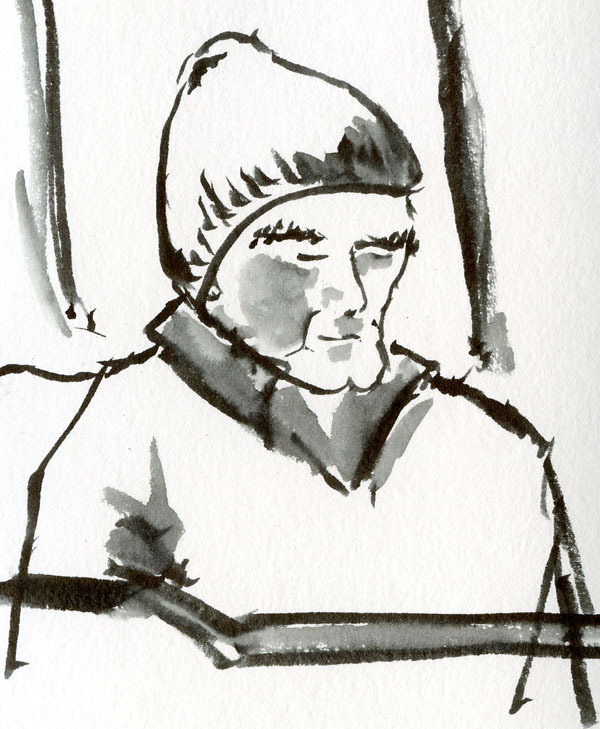 Still, the Platinum Carbon Black ink in the Kuretake brush pen looks great on the smooth stock, and the gel pen shows well enough that I still like it for highlights. In general, I don’t like blue as much as red, but I can see it has its place. Yellow (aptly named “Banana Split”) is another matter. 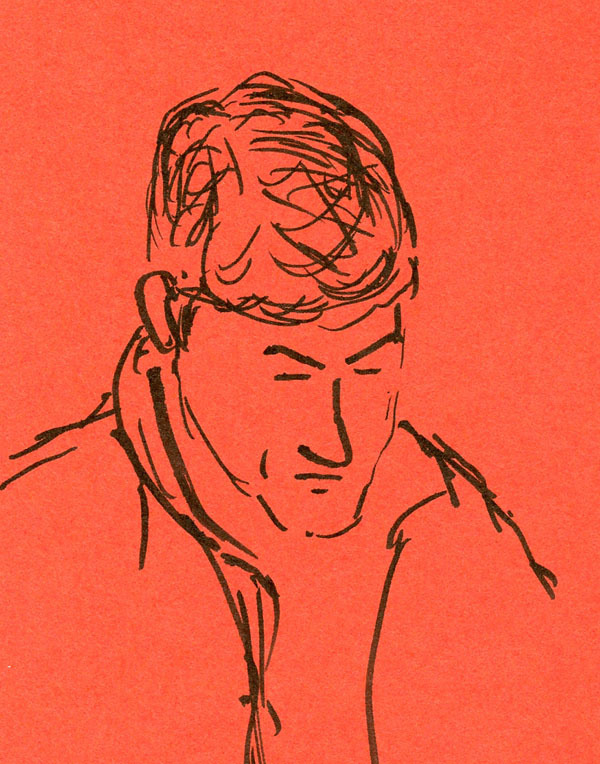 The white gel pen hardly shows at all, so it’s not useful as a toned paper. On the upside, I’m sure yellow could be used with any ink or writing instrument, just like white paper. 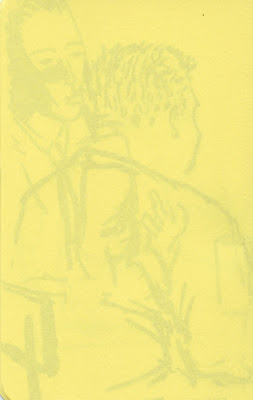 Much worse, though, is that show-through is significant from both the sketch on the reverse side as well as the page under it. 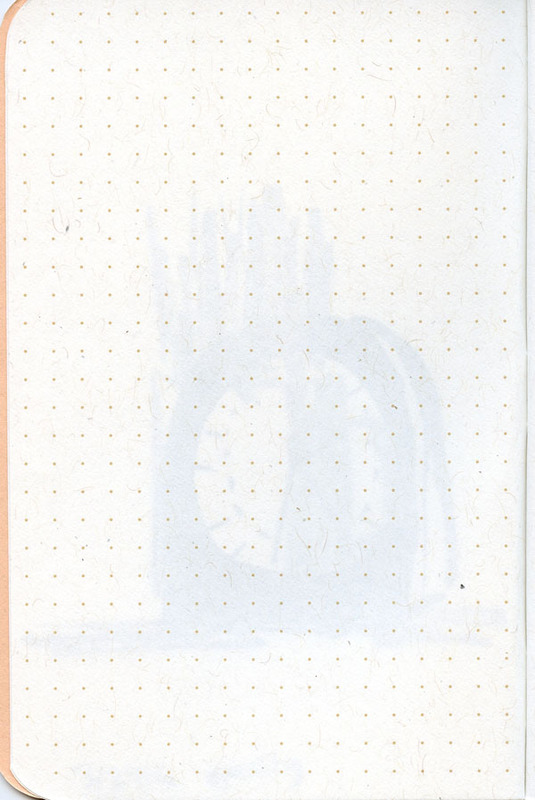 (Compared below is the reverse of Field Notes Workshop Companion, which has the same weight of paper, but seems more opaque to my eye, even though it is white.) Both red and blue are completely opaque and display no show-through at all. There you have it. You read it here first. 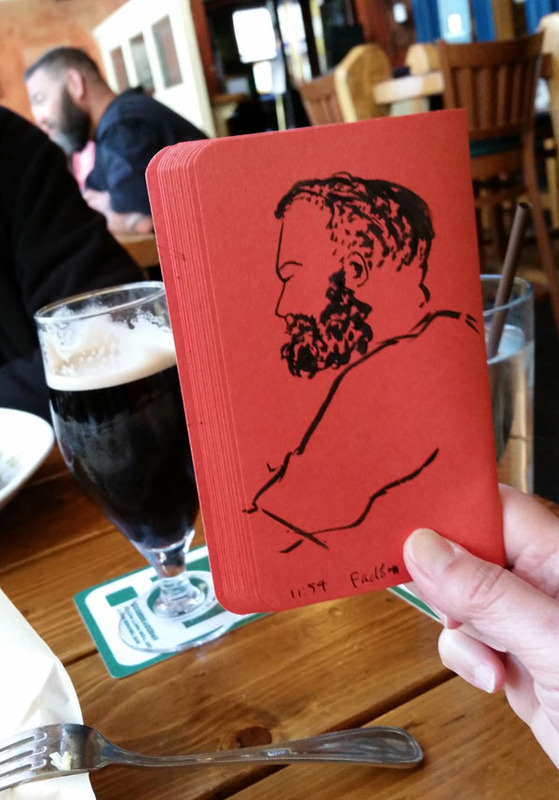 Meanwhile, I’m going to spend the remainder of these wet and blustery spring days filling these notebooks until my teeth ache. 3/22/16 Pilot Parallel fountain pen, Field Notes Sweet Tooth edition. 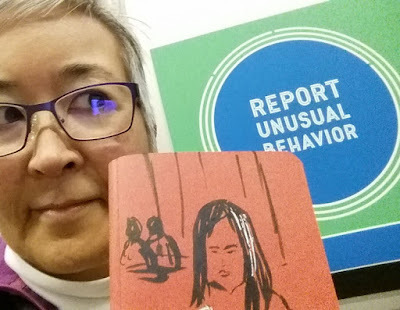 I’m a sucker – again. Maybe it was the candy theme, or maybe it was just the playful colors. 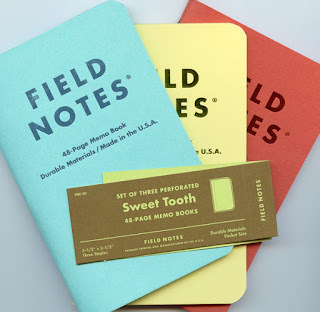 In any case, despite knowing that Field Notes Brand notebooks have failed me again and again, I succumbed to temptation and traded with someone on Facebook for a pack of the latest limited edition release, Sweet Tooth. I was able to resist the last couple of editions because I knew the paper weight wouldn’t satisfy me, but Sweet Tooth contains 70-pound paper (same weight as the Workshop Companion, which is the only edition I’ve been happy sketching in). 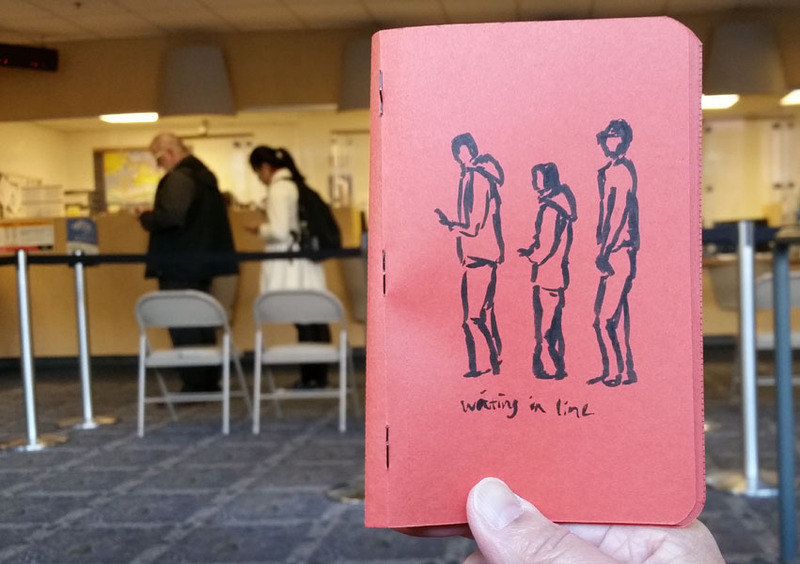 It’s also Field Notes’ first edition with no ruling at all. I’ve been clamoring for more books with blank pages for years – but ironically and cruelly, these blank pages are colored. When I saw those colors, I knew they wouldn’t be much good for general sketching. 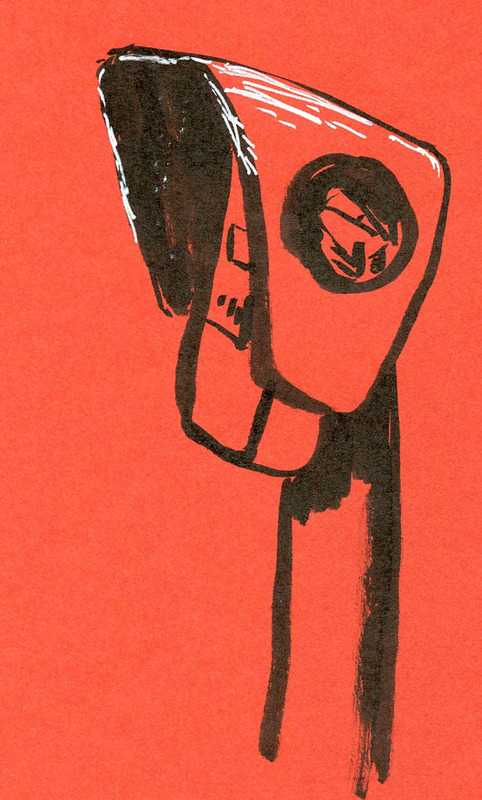 The red (“Tangy Orange,” according to the specs) is the darkest and probably the most difficult of the three colors to sketch on, but in general I like the look of stark black against red, so I started with that one. After sketching the magnolia tree in Shoreline yesterday, I turned my car around 180 degrees for a different view and took out a modified Pilot Parallel pen filled with black ink. 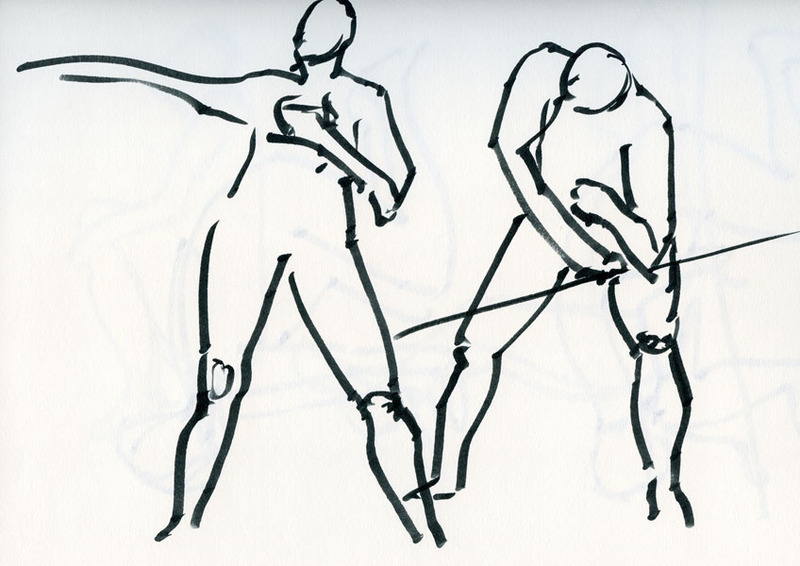 Taking advantage of the pen’s ability to make a variety of marks, I just went for the silhouette look (above). 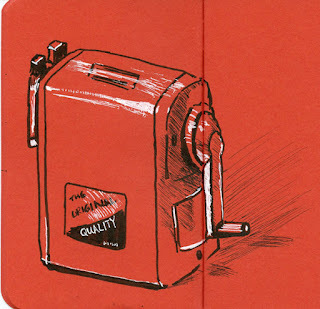 As expected, the 70-pound paper held up well to the Parallel’s heavy output of ink. 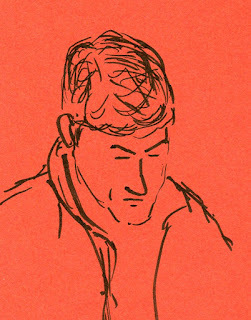 In fact, the modified nib is a little rough, sometimes scratching the paper when I go over the same lines several times, yet there was no trace of ghosting or bleeding. Washing a few test marks didn’t cause ghosting, either. The result was a stark, surreal look that I actually like. It’s not for every day, but it might be just right for days when I’m seeing red. colors are the same as the covers. Maybe I’m not a sucker after all. Incidentally, this edition has another unique feature: the pages are perforated. I always carry a small scratch pad (the kind found next to hotel room phones, where I also get my ballpoint pens) in my bag for jotting information to give to others. 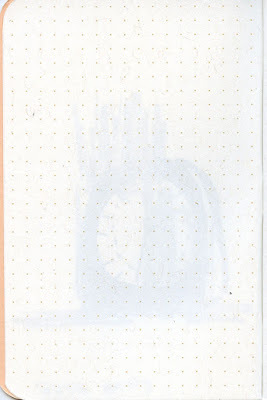 Carrying a Sweet Tooth has eliminated the scratch pad from my bag – I’ll just rip out a page from the back. In related news, I’ve lately taken a “If you can’t beat ‘em, join ‘em” attitude about all the rest of my Field Notes and other brands of notebooks containing paper I can’t use with a fountain pen. Instead of whining, I now use – ta-da! 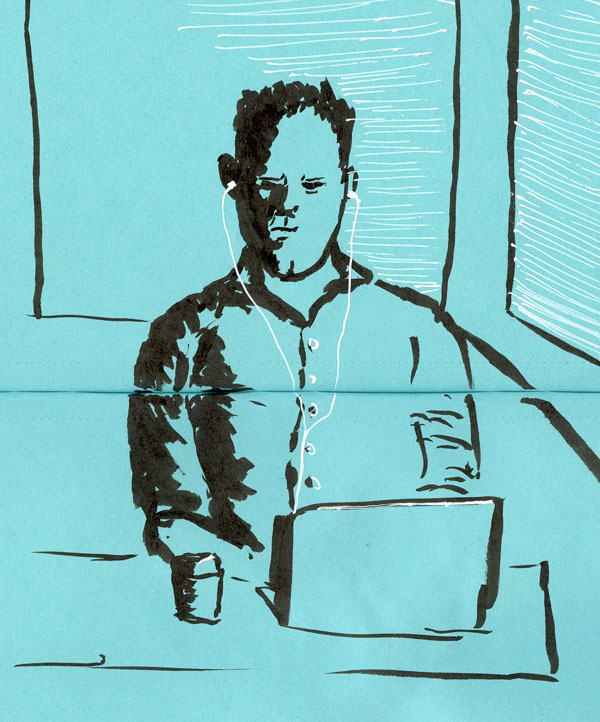 – a ballpoint pen like the rest of the cheap-paper-using world. Ever since I “discovered” them a couple months ago, I’ve continued to experiment with ballpoints in certain circumstances, usually when riding the bus. In addition to writing on any paper I happen to have, retractable ballpoints have an important benefit that I hadn’t even thought of until I started using them: I no longer have to worry (somewhat neurotically) about dropping a fountain pen cap and having it roll away under the bus seats, never to be seen again. Surprisingly, my brush pens – both hairy and non-hairy alike – also do well in these notebooks that are unfriendly to fountain pens. So I really have stopped whining. Really! At least about pocket notebooks. This week. Although magnolia trees are not the harbinger of spring that cherry blossoms are, their beauty is just as fleeting. On my way home from a meeting in Shoreline, this magnolia’s intense and varying shades of pink brightened up an otherwise gray morning. 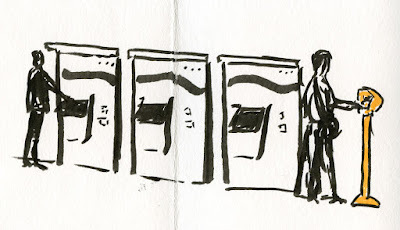 The other day Larry blogged about the value of warming up. 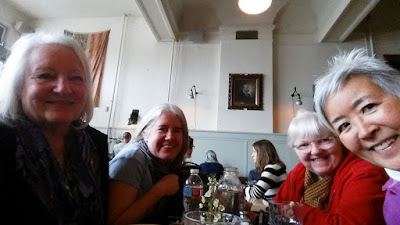 I was reminded of the short workshop I took with Bill Evans more than a year ago. He talked about his practice of making a dozen or so quick sketches from life every day, usually after work at his favorite neighborhood bar or park. 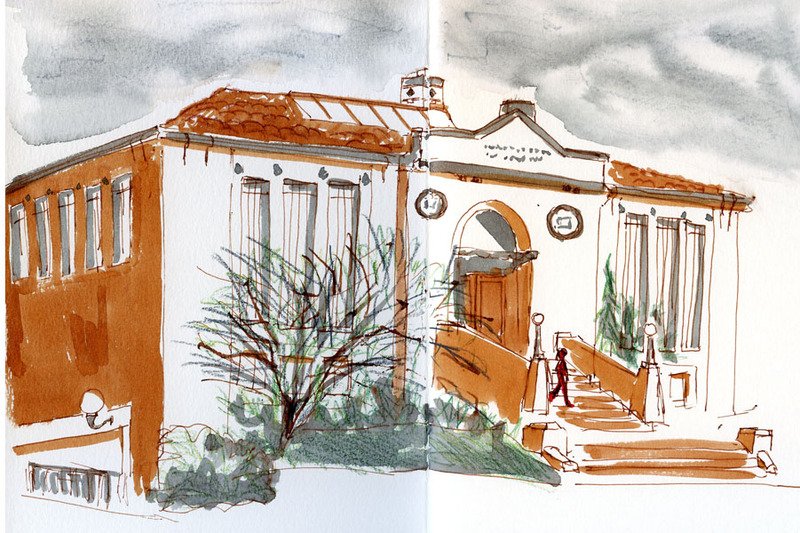 Although he’s been doing it for decades, even over the course of one evening, he sees his own sketches improve from the first to the last. 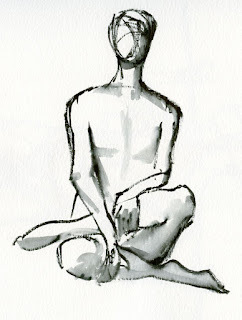 I definitely see this in my own life drawing practice, too. 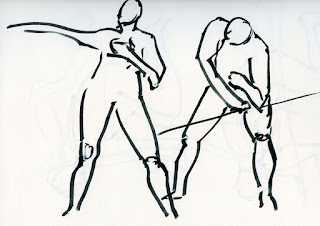 For me, “warming up” is both literal – getting the blood circulating in my cold hand and arm so that they move more fluidly; and figurative – a loosening of the line and gesture. And I’ve noticed that the longer it’s been since the last time I’ve practiced, the longer it takes me to feel warmed up. 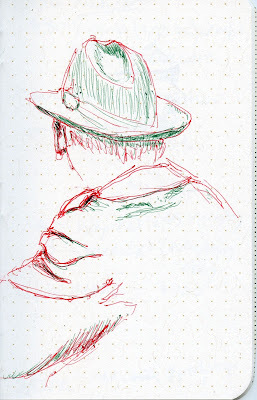 The sketches at the top of the page are my first two one-minute sketches this morning at Gage. By the end of that 20-minute set, I wasn’t fully warmed up, but getting there. 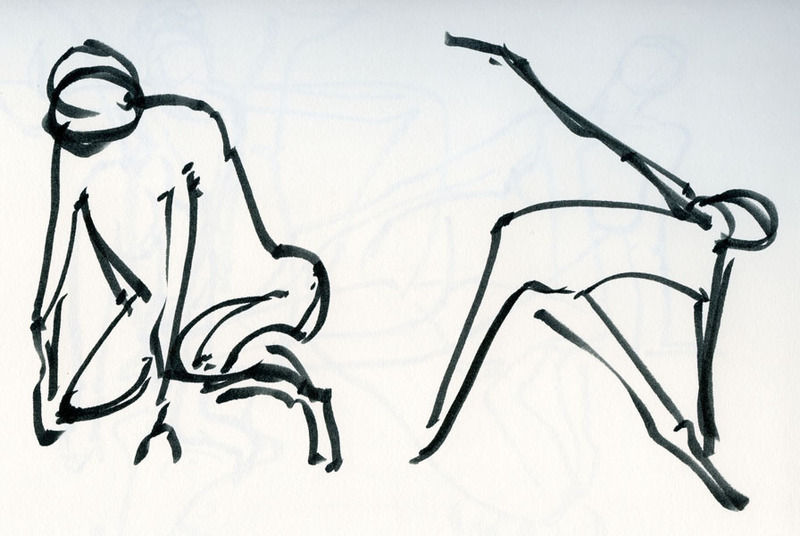 Usually by the end of the two-minute poses, I’m feeling sufficiently ready for the longer poses to come. You always have to toss the first pancake just to get the pan seasoned. 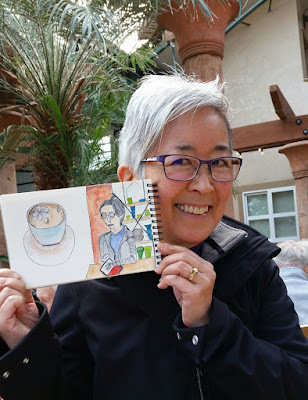 The International Urban Sketchers Symposium will be held in Manchester, UK, this year, and I’m thrilled that I will be there! You can imagine how excited I am to have my Urban Sketchers dream come true! I’m going to be one of four symposium correspondents sketching by day and blogging by night. It will be a busy and probably exhausting three days, but I’m betting that it will also be an unforgettable experience. Here’s the official announcement! 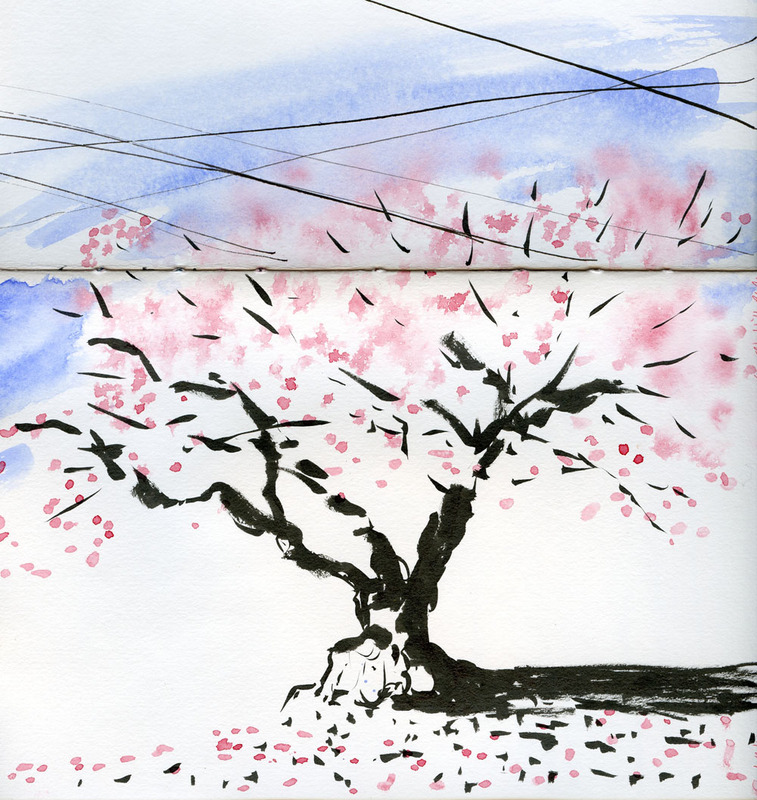 The tiny cherry tree at left was in full blossom when I sketched it a few days ago. Although it doesn’t look like much – braces keep its spindly trunk from toppling over in the windstorms we’ve been having lately – I’ve sketched it three times in the past month. Replacing a much larger, old tree that had to be taken out a year ago in front of the Seattle Public Library’s Green Lake branch, this little tree seems precious. 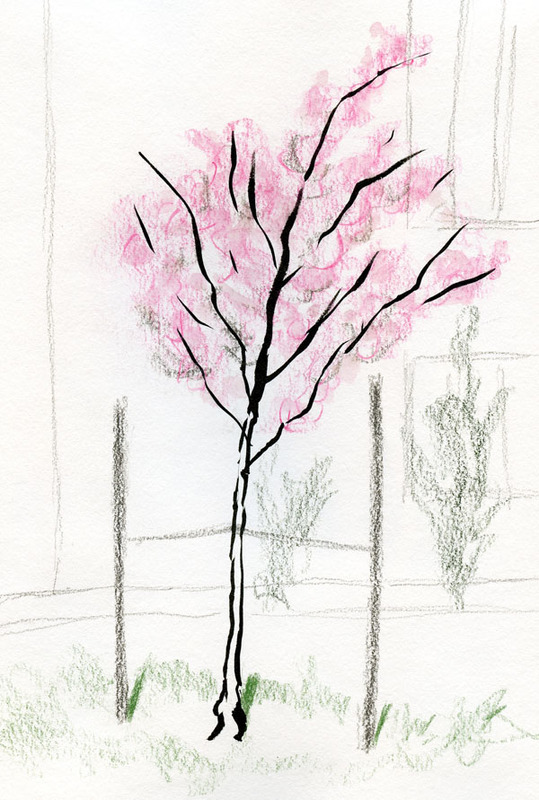 I first sketched it about a month ago when I could barely see the buds. Two weeks ago I spotted some pink. Shown at bottom is the old tree that had to be removed for some sewer work (and the excavator digging the hole where it used to stand). 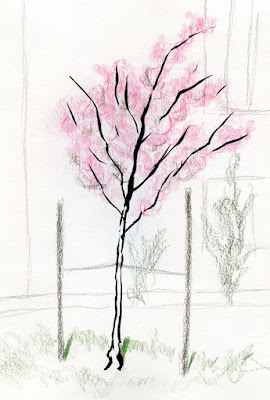 I miss that old tree – sketched in February last year, it had always been an early bloomer – but the young one will be fun to sketch, year after year, as it grows. Yesterday was a little too cold to take the top down to Dibble Avenue, but not today! Wearing multiple layers of Polartec, I could still feel the chill in the wind, but I didn’t care – as far as I’m concerned, spring is on its way! One thing I love about driving a convertible is that I catch more scents around me. Granted, some city smells (like exhaust) aren’t my favorite, but this afternoon was made for my Miata. 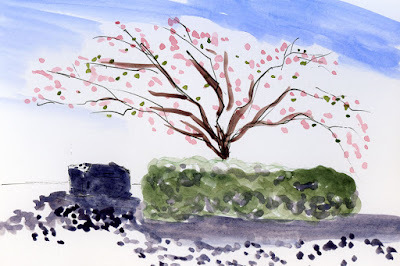 I rounded the corner on 32nd Avenue Northwest near Sunset Hill Park, and even before I spotted the cherry trees, I could smell their delicate scent. 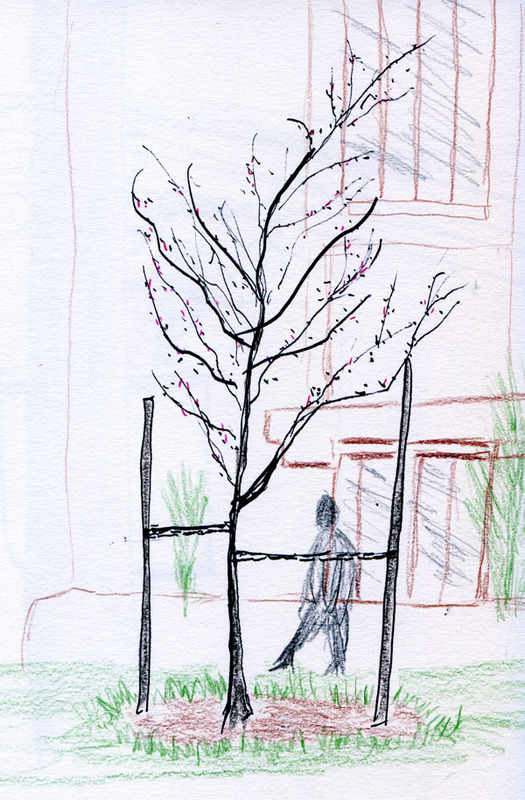 I’d entered fairyland, the block on 33rd where the trees are particularly old and gnarly, thick branches spreading wide across the street. The third and last of my must-see cherry blossom spots each year (the other two are the UW Quad and Dibble), this street was at its absolute peak today. As I did last year and the year before, I walked slowly up and down the block a few times (on either sidewalk and even the middle of the street – hardly any cars came by), looking for an individual tree to sketch. Each has a distinctive, knobby trunk as broad as a boulder. 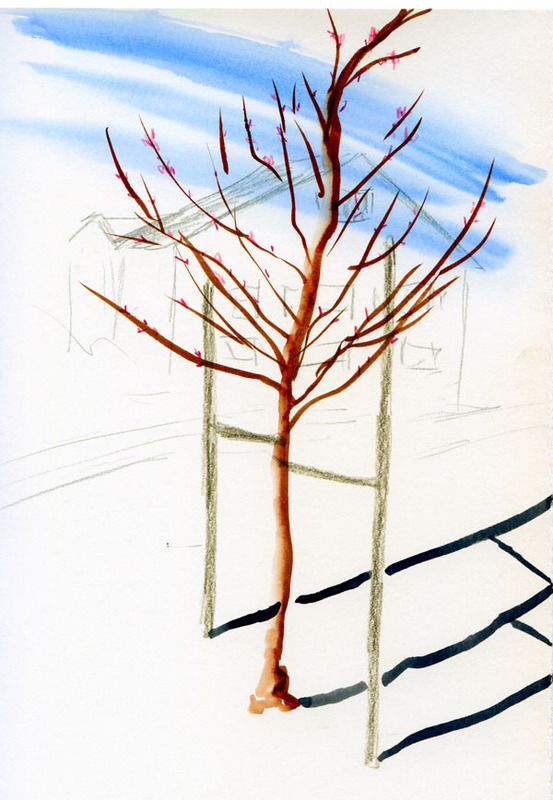 I picked the one for this year’s portrait – its branches wide open, welcoming spring.